Duration: 3/20 (Tue) to 3/27 (Tue). 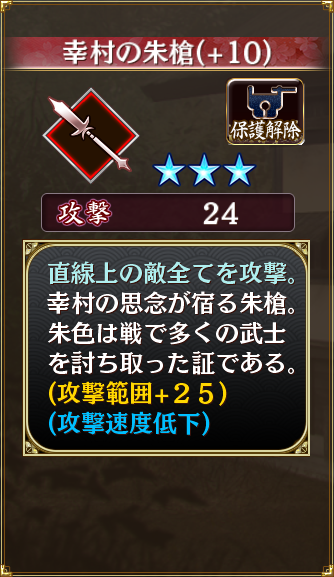 Weapon reward event with a Plains-type bonus. Warehouses have a chance to drop [Spirit Steel] and [High Grade Spirit Steel] instead of affection items. These are used in place of other weapons when upgrading weapons, and have the same success rate. 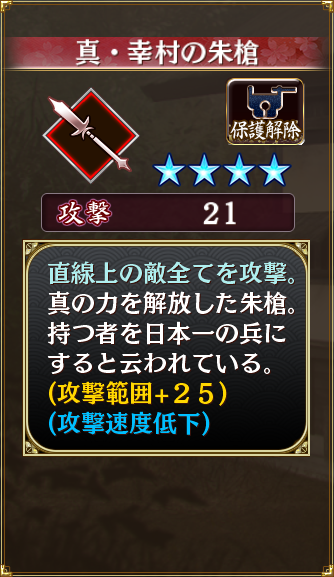 Yukimura does multiple hits, so you can heal through them with an upgrade if you time it right, but it can also do a lot of damage if you don't have enough defense. 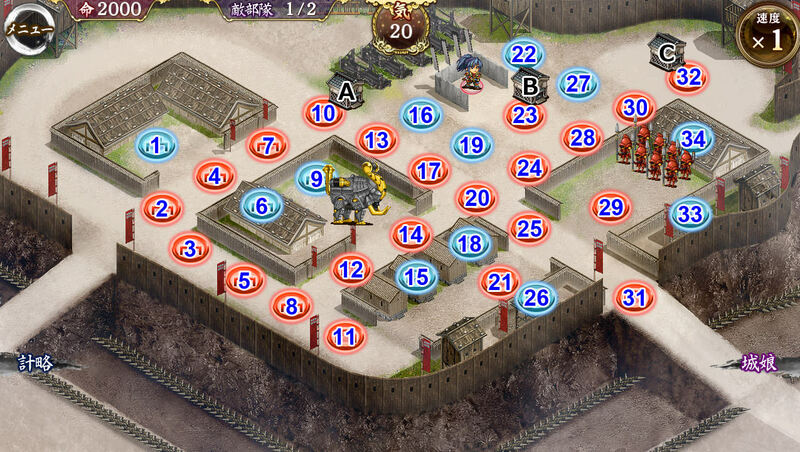 Osaka sits in her position at the top left until the end of the map and leaves 3-1. While she's alive, the enemies gain +125 ATK and +25% ASPD. I would recommend a Talisman or a strong Bell at 7 so you can slow down/support against the two hammers. They are very tanky so it takes a long time to kill them. You'll probably want a melee somewhere along 2-4-8-11 and a blocker at 21. Avoid 15/20 because the hammers will hit them and splash A/B. 18 is also in range of the hammers if you block at 21. You probably want someone at 22 to protect ABD and a ranged around 28 to protect CE. 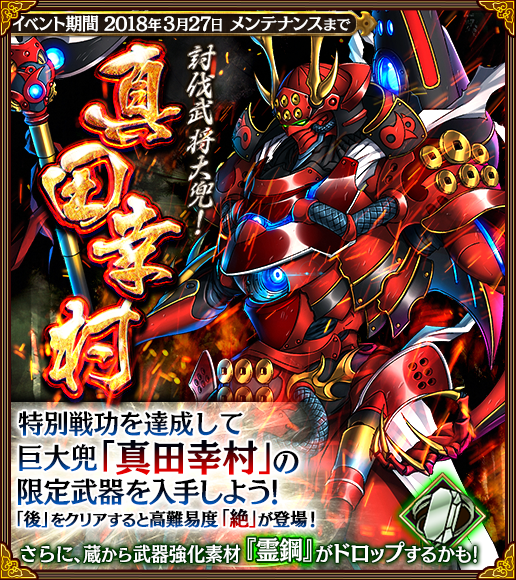 The enemies, even the fodder, overall are quite strong, so you'll need to be able to heal through them. A maxed Song at 13 or 22 is good to reach 21. You'll likely want supporting melee units around 14/17/26/27 to help kill whatever you block. 27 might have a hard time reaching the hammers when they get blocked at 21, but it's a good spot to help protect E, and deal damage to the two swords. A spear at 14 would be a decent choice to support as it also protects Tono from being hit for the mission. 26 is good for helping protect 22 and dealing with Hikone when she finally starts to move. Otherwise, it's a good opportunity to use a damage dealing stratagem since the waves end up being quite tight. Last edited by Folseus; 03-22-2018 at 11:51 AM.